When the collection plate went round in a North Carolina church, one of the donations was a mere 18 cents – worth 12 pence. 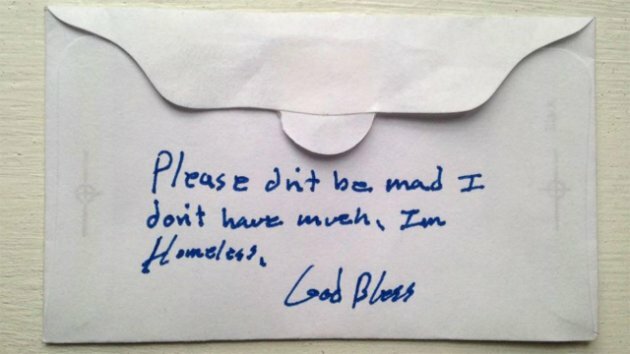 But when church volunteers turned over the envelope, they found it was from a homeless man. The church posted an image of the note on its Facebook page, alongside quotes from Jesus’s teachings. The homeless donor then called in, but said he preferred to remain anonymous. ‘After the service we have a couple of people called counters who process the offerings and put them in our safe,’ the church’s Pastor Patrick Hamrick told ABC News.